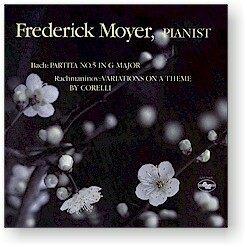 Frederick Moyer shines on his GM recording debut and offers a mature, balanced reading of two cornerstones of the piano literature. The Partitas of Bach marked an artistic culmination in the development of their form. The Variations of Rachmaninoff resembles his immensely popular Rhapsody on a Theme of Paganini which followed two years later. Recorded at Houghton Chapel at Wellesley College in Wellesley, Massachusetts.